First it rained, then it snowed… but only a measly 3″… so… it’s not so bad! It was 14˚ this morning though. Pretty brisk. There’s nothing like a grey, cold day with company coming to get some work done around the house. I admit it. My mother would be disappointed in me… I live in piles. Piles of clothes. Piles of craft materials. Piles of dishes. I try, but then, there they are! Like creatures from a parallel universe! They weren’t there before, but sheesh, all of a sudden, my desk is covered in mail and notes and lost recipes and craft odds and ends and candy wrappers (how’d they get there?) and cd’s (found my favorite Chris LeDoux and Corb Lund) and pictures of the twins and pictures of my dad and my folder on genealogy and those oil well plans my dad made that I was going to glue to my studio table (YAY!) and, well, I think you get the idea. Now, I can count the items on my desktop. Just don’t look at the bed… I promise tomorrow I’ll haul it all downstairs!!!! By tomorrow, though, my Indian room will be ready for my sister and brother-in-law! I’m very excited to have them arrive this weekend! 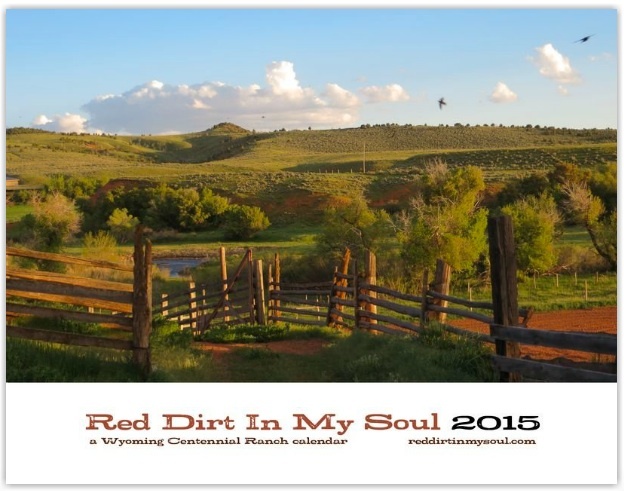 I also managed to finally get my font spaced the way I wanted on my calendar… so… the 2015 Red Dirt In My Soul calendar is up and going! I’m very happy with it! The front cover is probably my favorite photo of the year (which makes sense, I guess!) at least in the scenery department. I’ll put a link up on my sidebar so if you’re looking for a unique gift… the link will take you to it! Lulu prints them on demand, so I am not left with extra copies. I love this idea! So much so, that I started a black and white one too… I don’t expect it to sell as well, but I must say the black and whites and sepias are some of my favorite photos! A day or two and it should be ready as well… so… buy your color copies now… the monochromes in a bit!!! 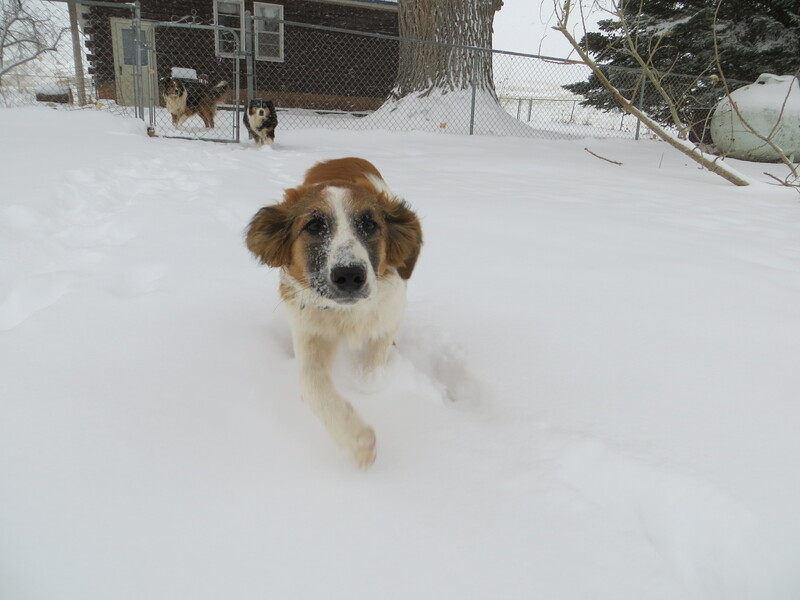 Eden was thrilled with the snow… it definitely gave her the Zoomies. 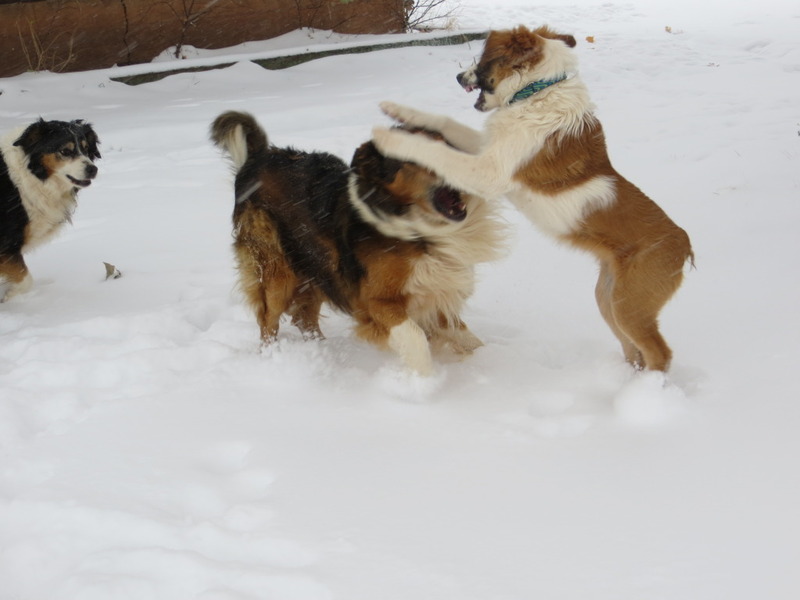 Lucas played and played with her… Dally just barks and demands that the nonsense CEASE! Immediately! She always has been the Fun Police! Snow, cold, dogs, and calendars! How exciting! Carol, did you know that Longmire has been cancelled by A&E network? They are trying to sell it to another network. The reason they cancelled it was because the audience that watched was too old, wrong demographics. Seems most shows are shot for the 18 – 45ish range. Sure will miss it. I am writing A&E and asking them not to cancel but I feel sure it will be for naught. Regarding those “piles”, now you know why I haven’t sent you something I promised I would send you. I love the calendar cover photo. I’m sure the rest will be just as good. and Lucas enjoying each other and the quite stuff. And the calendar picture you chose for the cover is spectacular. Love the composition and the late afternoon lighting. Those ES’s sure love the snow and cold- it sure turns on their motor …. how sweet of Lucas to play with her… they can have so much fun in that white stuff….